The last Clone Wars character who I would ever have expected to demonstrate any significant character growth or change would be Asajj Ventress, who from her first appearance seemed to be a fully heartless, firmly-set-in-her-ways agent of the Dark Side, and yet that is precisely what happens in episodes 4.19 and 4.20. That isn’t to say that she ever compromises who she is. Ventress doesn’t have any sort of spiritual reawakening that suddenly sees her reborn as a heroic character, but her path in life certainly does change. After being stripped of her master, Dooku, in her previous arc, the first of these two episodes, “Massacre,” sees her attempting to find a place for herself in her old home amongst the Nightsisters, and yet soon discovers the old “you can’t go home again” adage to be dreadfully accurate. 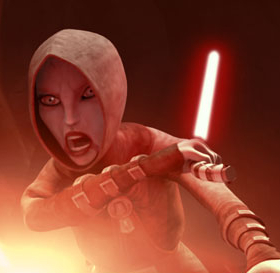 Sadly, for Ventress, her return to the temple of the Nightsisters occurs at the same time that Dooku decides to exact revenge against her and Mother Talzin for betraying him with Savage Opress, and so she only has a few moments of peace before having to go to war against her old Master again, in the form of General Grievous and his droid army. What’s fascinating about the depiction of the Nightsisters in this episode is that, although we know they use the Force to perform very dark magic, we also see the sense of love, loyalty, and sisterhood that they share. They would–and do–die to protect each other, and so despite their methods, one can see their noble qualities through their devotion to one another, much like the feelings of brotherhood amongst the Clones. This might be a very warped sort of home, but to a Dark Side user such as Ventress, it’s akin to returning to the warm embrace of the womb, and by the end of the episode, Dooku will have torn her away from the only remaining place and family where she feels that she belongs, just as he previously tore her away from her position as his apprentice and almost-daughter. Her anguish at the end of the episode is genuine. The Nightsisters don’t, however, go down without a fight, with their ancient member, Daka, raising an army of dead sisters against Grievous. 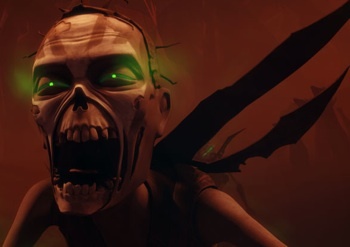 The animation for these reanimated corpses is genuinely stellar–they look positively horrifying, flesh rotting off the exposed bone of their expressionless skulls–and the idea of the zombie army itself is a perfect encapsulation of the Dark Side’s modus operandi, working not with the natural world, as the Light Side does, but instead against it, trying to subdue and conquer it, bending it to their will. It’s also an apt metaphor for Ventress’ failed attempt to resurrect what she had lost. 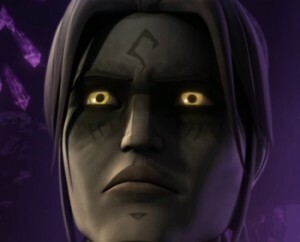 And despite the Nightsisters’ ultimate defeat, it is both scary and gratifying to see Talzin’s temporary punishment of Dooku, using a wax doll, like voodoo, to inflict suffering upon him unlike any he has ever felt before, burning him alive from the inside. The second episode, “Bounty,” isn’t nearly as interesting as the first. For large stretches, I actually found myself growing quite bored, which is a first for me with a Clone Wars episode, mostly because too much of it seemed to be taken up by repetitive action sequences that stretched far longer than they needed to, while also not seeming to contribute much to the Star Wars mythos. Sure, it’s cool, in a fannish sort of way, to see Ventress having to team up with young Boba Fett on a bounty hunter gig, and, as always, I do love seeing the Mos Eisley cantina pop up on Clone Wars, but the job itself doesn’t make for particularly compelling drama, at least for the bulk of the episode. It gets much more interesting nearer the end, when we learn that the “cargo” is actually a princess named Pluma Sodi who is to be delivered to the client, Otua Blank, so that she could be forcibly married to him, and that Ventress finds herself being able to relate to the young woman’s plight, having also been repeatedly torn away from the only homes she ever knew, first with the Nightsisters as a child, then when her Jedi Master was killed, again when Dooku attempted to have her killed, and yet again recently with the Nightsisters. When first bringing Savage Opress into the fold, it seemed for a short time that she might have had a bit of compassion left within her, after she spared his brother’s life. It wasn’t long afterwards, however, that we learned the only reason she did that was in order to later command him to kill him himself. Here, she is in a similar situation, when both Pluma and her brother, Krismo, plead her with her to let her escape. But this time around, due to the recent trauma she has faced, perhaps being humbled for the first time with the knowledge that her anger and wrath weren’t enough for her to win against Dooku, she agrees, instead overpowering Boba and delivering him to Blank. Again, she doesn’t suddenly transform into a good person. She not only collects her share of the money for the job that she sabotaged (but even in that, there is growth, as she does give the rest to the other bounty hunters on the team, rather than trying to keep it all for herself as the old Ventress–the one who killed the traitorous Republic commander for attempting to take credit for freeing Nute Gunray–probably would have done), but demands payment from Krismo, as well, in exchange for his sister, but regardless, she still did save her, which she had no obligation to do. She very easily could have simply collected her money from the job itself. The credits she demands from Krismo seem more about reassuring herself that she hasn’t gone soft than about the money itself. But she saw something of the younger her in the girl, and that touched her in a way she never would have allowed herself to be when she was still working for Dooku. She ends these episodes truly working as a free agent for the first time, free of the ties of any Master and, for the first time on the series, not simply evil but morally ambiguous, which alone is a huge progression for a character who has only grown more and more fascinating.